Pearl Burrus and Vera Carp return to Emcee the event again this year. These two characters — two of the 22 zany characters from Greater Tuna, a satirical comedy about small towns, small minds, and big hearts — had the Cook-Off crowd in stitches with their off-the-cuff and sometimes off-color quips. They appear courtesy of Incanto, where their play returns soon. Local, Old Town restaurant, Warique, is our Amigo Sponsor and local bars, Andale’s, Captain Don’s, Murphy’s Irish Pub, Nacho Daddy, Que Pasa & Winston’s Bar & Grill, are our T-shirt Sponsors. Two bottles of Patron Tequila will be raffled off. Bring a non-perishable food item for one free raffle ticket. 1 ticket per donated item. Food will be distributed to those in need. Last year it went to the victims of hurricane Willa in San Blas. All proceeds from the cook-off go to local charities and community projects, including: Supporting DIF in their support to Senior Citizens, DIF - A Mexican public institution of social assistance that focuses on strengthening and developing the welfare of the Mexican families; Jay Sadler Community Relations Projects A.C. – In 2018 38 projects were completed; in 2017 30 projects; during the past 5 years, 140 projects. 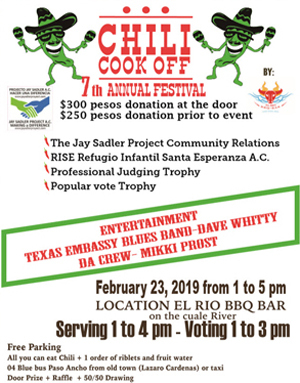 Tickets to the Chili Cook-off can be purchased at the door or in advance from many of the event's sponsors: All-Access, Café Roma, Captain Don's, DZ Route 66, Escondida Sports Bar, Gringo Loco, Kelly's Pour Favor, Los Muertos Brewery, Murphy’s Irish Pub, Nacho Daddy, Que Pasa, The Salty Caesar, Refugio Infantil Santa Esperenza A.C. RISE, Suriya Events and Winston’s Bar & Grill. Also Making chili Coco Tropical Restaurant, El Torito Sports Bar and Marriott Champions Sports Bar. Doors open at 12:00 pm. Chili will be served from 1:00 to 4:00 pm and voting will run from 1:00-3:00 pm. Confirmed Professional Chili Judges include Gary Beck (Puerto Vallarta Shows: More of Beck’s Best: Theater, Cabaret and More; Puerto Vallarta Restaurant Guide Beck’s Best; Gary’s Groupies), Paul Mayer (Vallarta Food Tours), Madeline Celeste (Vallarta Tribune Editor) and Jim Lee (Living Vallarta). For more information on The Jay Sadler Project contact Dennis Rike at dennis2rike@hotmail.com. El Rio BBQ Bar is located in Paso Ancho, in a beautiful setting alongside the Cuale River, less than ten minutes from the Libramiento. Bus route #4 (R04) to Paso Ancho or Paso de Guayabo drops you right at the gate. Ask the driver if he's heading to Paso Ancho if you have any doubt. For more information, call El RIO BBQ Bar at 322-222-2510. Driving Directions: from the south or El Centro/Old Town, take the Libramiento through the small tunnel, then turn right at the signal just past the bridge. From the north, turn left at the signal after the large tunnel and just before the bridge. Free parking will be available. There is a new concrete road from the highway to the El Rio. The Jay Sadler Project Community Relations (COMREL) program provides necessary resources to improve various charities and non-profit institutions in the Banderas Bay area. It is an approved IJAH Charity and works with the Fundación Punta de Mita. The Fundación Punta de Mita can issue a tax deductible 501C receipt for donations from the US and similar receipts for donations received from Canada and Mexico.